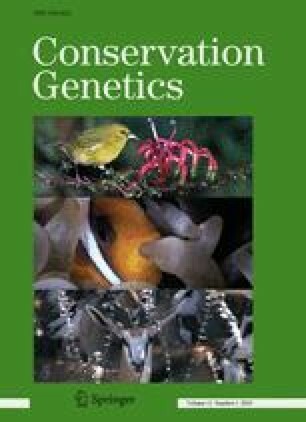 Decreased fitness due to loss of genetic variation is a well recognised issue in conservation biology. Along the Swedish west coast, the endangered natterjack toad (Bufo calamita) occurs on, for the species, highly unusual habitat of rocky islands. Although the toads inhabit a restricted geographical area (maximum distance between the populations is 71 km), the fragmented nature of the landscape makes the genetic properties of the populations of conservation interest. However, lack of genetic variation found using conventional methods (microsatellites) has impeded genetic studies within these peripheral populations so far. In this study we assess population structure and genetic variation among seven of these fringe populations using 105 polymorphic Amplified Fragment Length Polymorphism (AFLP) loci. We found a well-defined population structure without evidence for isolation by distance, implying restricted gene flow between populations. Additionally, the populations differed in their amount of genetic variation, emphasizing the need to monitor genetically impoverished populations for possible declines mediated by inbreeding depression and reduced adaptive potential. Conservation implications for these unique populations are discussed in the light of our results. We thank Sara Bergek and Andreas Rudh for comments on earlier versions of this manuscript, and Maarten Hofman and Jonas Andersson for help with the map. The project was funded by Formas (to J. Höglund) and Zoologiska stiftelsen (B. Rogell). The study was conducted under permissions from the Ethical Committee for Animal Experiments in Uppsala County and the county board in Västra Götaland.